Get This Bestseller - Free! Your complimentary book is waiting for you. Just tell us where to mail it - soon you'll be holding a signed copy. As a doctor, you face great responsibility and pressure. You are passionate about your patients' healthcare. As a retired doctor, Jason Dyken understands - and he is passionate about your wealthcare. He focuses on your financial goal, freeing you to focus on your patients. What we believe about those values frames our activities, decisions, and interactions. We focus exclusively on financial planning for healthcare professionals like you. Our proprietary approach, the C.U.R.E., lays the four cornerstones of your financial life. Your patients trust you as their healthcare specialist. While on duty, you must be alert and assured. you must employ comprehensive knowledge with precise attention to detail. Your end goal is the comfort and health of your patients. You should expect no less of your financial advocate. We want to be your trusted wealthcare specialist. 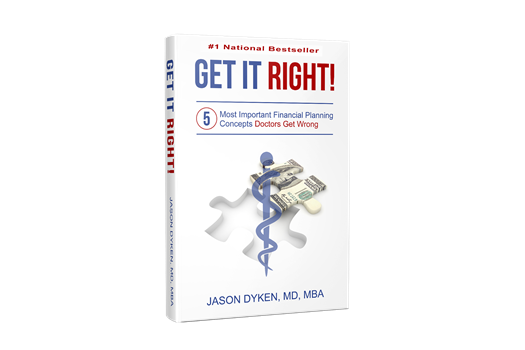 Dr. Jason Dyken spent 10 years practicing internal medicine and has now spent 15 more years helping his fellow doctors make the right decisions about money. He can help you too. Our 32-point checklist for doctors will tell you. How do you think you rate? Do you know how to get the most tax free income during retirement? Did you know there are LIVING benefits to life insurance? Do you want to find out how to get the most out of your policy? Download this FREE Life Insurance For Doctors 101 E-book.